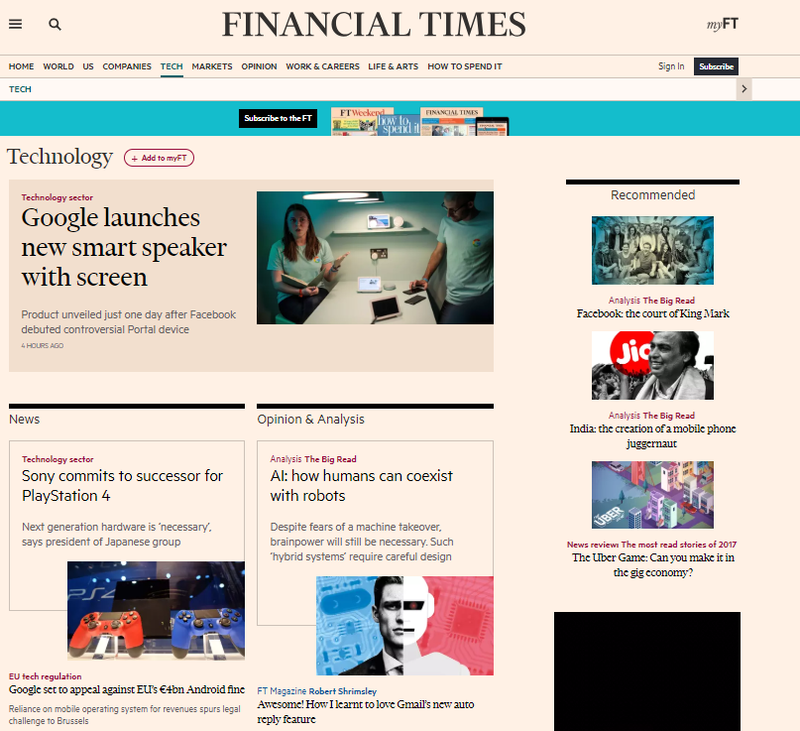 The Financial Times has announced plans to expand its tech coverage, acknowledging the growing influence of technology across all sectors. The move is part of a broader trend in recent years in which media outlets including The Wall Street Journal, CNBC, and CNN have dedicated increasing resources to this area. Perhaps it’s because of the famous maxim that every company is a software company now. Whether it’s manufacturing, automotive, insurance or pharmaceuticals, it’s become impossible to separate the tech innovation from a specific sector. Publications are increasingly addressing that fact by offering increased tech coverage. What’s more, the traditional tech sector itself has changed dramatically over the last decade. Instead of a handful of dominant companies like Microsoft, Oracle, SAP and IBM, we have a new generation of tech powerhouses including companies like Netflix, Salesforce, and Amazon – not to mention a whole universe of startups trying their best to out-innovate the bigger players. In response to this, the FT, which had been organized into four broad coverage desks (Companies, Markets, World News, UK/National News), decided to build a dedicated desk specifically for tech. Prior to adding this specialized group, tech tended to fall under Companies in the FT organizational structure. This resulted in coverage of the larger players in the sector. Smaller tech startups tended to fall by the wayside and readers were hungry for more comprehensive information, Malcolm Moore, the new Technology News Editor told DCN. The FT decided to form a dedicated group of reporters exploring every aspect of tech from startups all the way up to the largest vendors. They wanted to cover the bigger picture as well, including policy, regulation, and innovation. Internally, the idea of building a desk dedicated to technology began to take shape. “We thought wouldn’t it be a good idea to have a dedicated tech desk on top of the existing ones, a fifth desk, to give us a more holistic approach to it all. This would let us cover early companies a bit more, we can cover innovation a bit more, and we can cover this [broader] intersection of business with the with the tech industry,” Moore explained. Moore said a big part of the FT’s value for readers is providing them with insight they won’t get anywhere else. And, as technology has grown increasingly critical to investors, the audience indicated that they wanted more information to help them understand this pivotal industry better. “We collect a lot of data from our readers. We also survey them a lot. What came back to us time and time again is that they wanted more technology coverage,” he said. FT editor Lionel Barber pointed out that publication has had broad tech coverage for 20 years with teams in Silicon Valley, Washington, Brussels, and across Asia. However, this is the first time the company put all that coverage together under a single banner. It’s in recognition of the growing importance of this coverage area for readers. “Technology permeates all areas of our lives and impacts global economies, markets and societies. The creation of this new team reflects the importance of this topic to our readers,” Barber said in a statement. The new group began to come together over the last six months, although Moore says his bosses have been thinking about this even longer. Moore, who had covered tech in Asia for the last eight years, was tasked with leading the effort. Though the new section went live on October 1st, he says the tech desk is still a work in progress. With a new area, they also have to figure out how where the coverage falls. That requires communication between reporters and editors, and they are still learning how to bring different kinds of expertise together. “We have tech reporters and amazing sector specialists. As tech spills over into the different sectors, we can link specialists outside of tech with our tech reporters,” he explained. It will take time to learn where to define the coverage and nail down exactly how many people will be needed to staff the FT’s tech desk. Moore wants to build a team made up of experienced journalists, combined with young and hungry reporters working on the ground, as well people with deep technical understanding of the underlying technologies. “It’s an ongoing process,” he says, but like other media outlets, the FT recognizes tech matters to readers and like any smart business, they are making sure they give them what they want.